But, I now think (actually, I know) that we need to design spaces that take into account the principles of student centered learning, learning centered, professional development and pilot projects, interdisciplinary teaching, collaboration, shared space, maximizing all space, flexibility, agility, sustainability (sun, wind, & energy), supports all learning styles and types, and integrated the community and school. And now, I also think (actually I know) we need to use architectural and learning theory, emerging technologies, environmental sustainability, child and adult collaboration, and community engagement to create “AGILE” learning facilities that can be flexed into the 22nd Century without taking millions, or even billions of dollars to sustain or modernize in another 60 years. 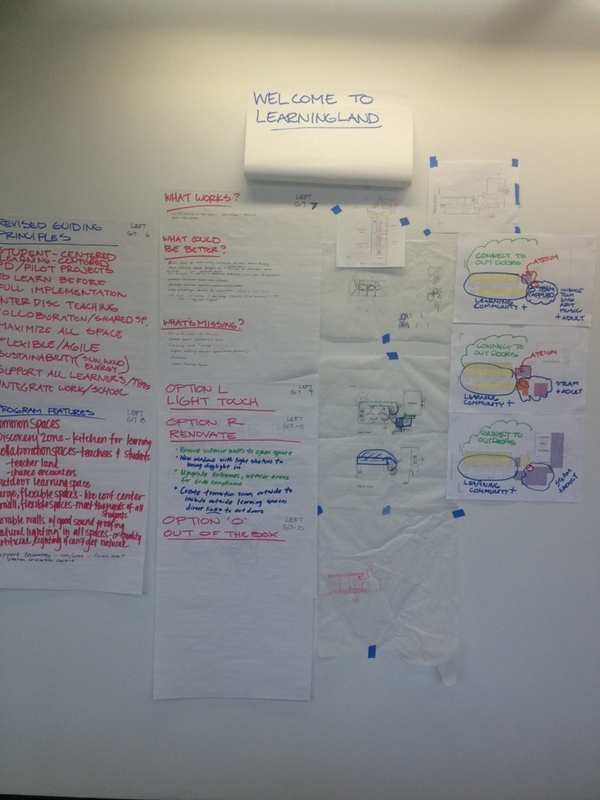 The photo in this post is of the visual work process of the Design Team Project my classmates and I created. We called it LEARNING LAND! Sounds like a fun place to be, huh? 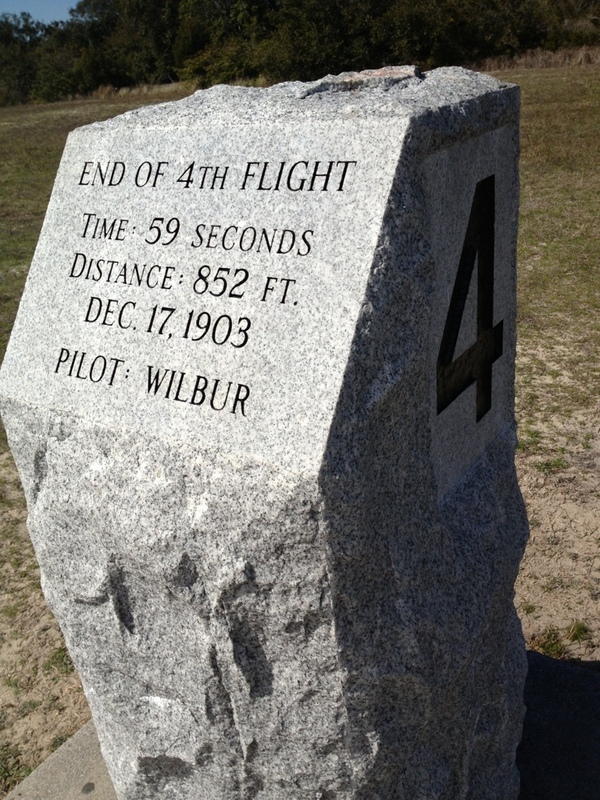 As I stood at the monument (pictured in this post) marking the fourth fiight on that blustery December 17th day I reflected on the first time I stood beside the Wright Flyer at the Smithsonian Institution. The plaque at the exhibit reads: “THE ORIGINAL WRIGHT BROTHERS AEROPLANE: The world’s first power-driven, heavier-than-air machine in which man made free, controlled and sustained flight, invented and built by Wilbur and Orville Wright flown by them at Kitty Hawk, North Carolina December 17, 1903. By original scientific research the Wright Brothers discovered the principles of human flight as inventors, builders, and flyers they further developed the aeroplane, taught man to fly, and opened the era of aviation.” Think about what this says, they “…opened the era of aviation.” What a leadership legacy! In 1901 Wilbur and Orville had tested their latest glider design. The performance was improved and the control bugs were worked out, but the Wrights were perplexed about why their calculations were still off. Their response to this was unique and would he reason enough to regard the Wrights as the first to fly. They constructed a wind tunnel in the rear of their bicycle shop and conducted precise tests of different wing sections. The tunnel was only six feet long by sixteen inches square, with a glass window in the top panel to allow observation. A steady fan driven by a small gas engine blew air through the box at a steady twenty-seven miles per hour ), and inside, balance and spring scales measured lift and pressure on a variety of airfoils. In these experiments, the Wrights raised aviation experimentation to the level of serious engineering. The Wrights discovered that much of the published data on wing design was incorrect or had ignored important elements of flight. After testing two hundred different wing surfaces, the brothers used their newly gained information to design Glider Number 3. As leaders we must do our own research and not take for granted the opinions of others. The Wright Brothers put the necessary time and research into finding the best design. They did this all in the name of bringing about social change! This is what great leaders do! How did the Wright brothers succeed where a better equipped, better funded and better-educated team could not? They started with why! They developed a technology that would change the world. Only the Wright brothers started with why! 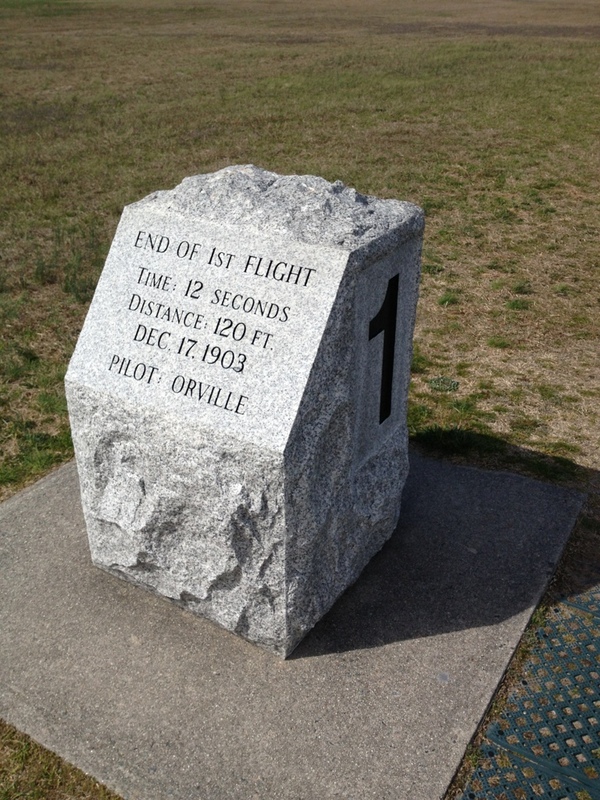 Ironically, while I stood at this third flight marker a pair of fighter jets went over. I’m so glad the Wright brothers imagined a world in which we’d all take to the skies as easily as we catch the bus. And it happened. Remember, if you’re not trying to change the world, you haven’t entered the realm of the EXTREME LEADER! The Wright brothers invented the flying machine in a little more than four years, and spent less than one thousand dollars on the entire project. The brothers went about their discovery in a methodical, deliberate manor, and for the most part, they were confident that success was only a matter of time and effort. 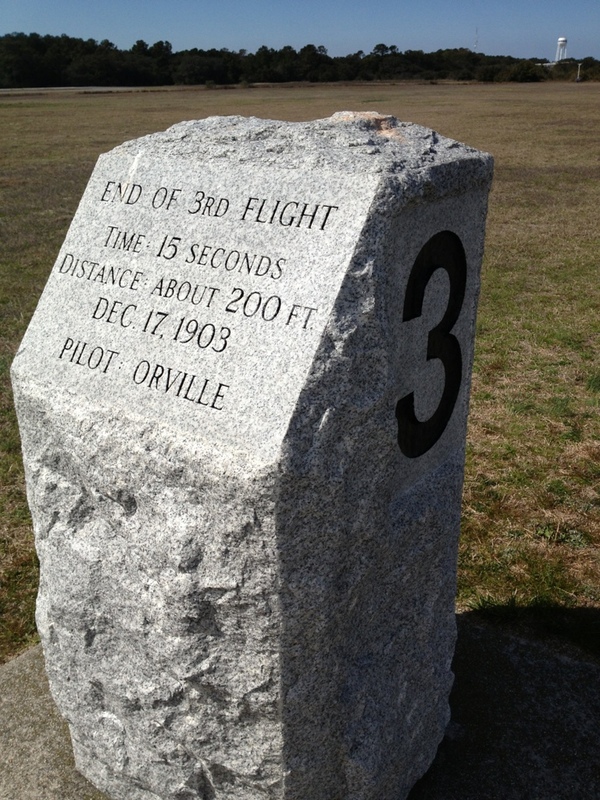 As I stood at the marker for the second flight I thought about the others, such as Samual Langley, who was far more educated and well financed for the task of being first in flight. What the Wright Brothers lacked in education and financing, however, they made up for in determination, and a single-minded devotion to the task at hand. Many people begin a new endeavor and don’t really give it the the determination needed for success. As Malcolm Gladwell said it takes 10,000 hours of practice to become great. Imagine if the Wright brothers “tried” flying for a couple of months and then gave up saying “we are just no good at flying.” It sounds humorous but many people do this when starting a new project. 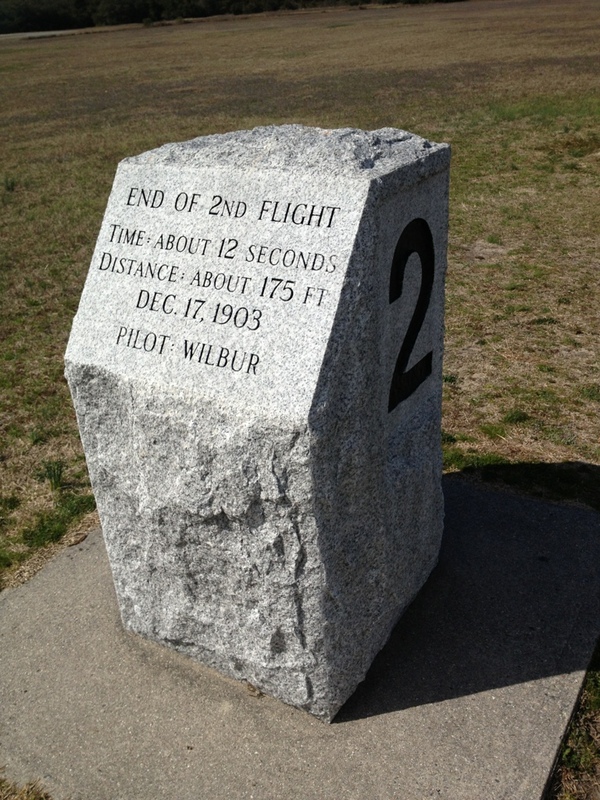 At the second marker pictured in this post I thought about the thousands of glider flights testing designs and the tenacity it took to drag the plane back on December 17th, 1903 for two more flights trying to go farther still and stay in the air longer. The next time you are in the middle of that monster project think about the journey the Wright Brothers took to give us the gift of flight! Today I walked the sandy ground where all of the Wright Brother’s extreme leadership, genius, and tenacity culminated in the first flight. To stand by the rail that the Wright Flyers slid down as a runway was breathtaking to say the least. I have been a student of their journey for many years and finally got to walk the testing grounds. What really made me go “WOW” today was seeing and walking the length of the first flight. 12 seconds and 120 feet! I had to think, “Would I have called this success or written it off as – not enough?” Well, the Wright Brothers did both. They called it success and then said that’s not enough. In fact, they carried the plane back and made three more flights – I am going to do three more posts over the next three days using those flights. So, stay tuned! Wilbur Wright said, “…it is not really necessary to look too far into the future; we see enough already to be certain it will be magnificent. Only let us hurry and open the roads.” I for one am glad and inspired by the fact the the Wright brothers had the fortitude to come back to Kill Devil Hill year after year till they got it right. In an age of instant gratification, I hope we all continue to look to these two great Americans and the many great leaders before and after them, who have achieved the unthinkable, and their achievements changed our lives.Think about it, with their game-changing feat, the Wright brothers became our exemplary innovators who helped bring about America’s rise as an economic superpower! It is their example that inspired the kind of businesses and industries that built and grew our nation, continue to solve the issues of today, and change the way we live our lives. As I stood on this hallowed ground today my prayer was and continues to be that I can carry their legacy forward by taking on new challenges with tenacity and meeting the hardships of my leadership roles with courage and confidence. If all leaders do this, our shared future is bright and our best days are still ahead. I pray this will have have the same inspiration for you!